Today we will learn about air brake system. Air braking system is one of a high power braking system. It is commonly used on heavy vehicles, like trucks, buses, etc. In my previous post we have discussed about types of brakes and we know that there are only two types of braking system. The first one is known as disk brake and other one is drum brake. These brakes are operated by human manually or by any other power source. According to the power source these brakes can be classified into other types like hydraulic brake, air brake, vacuum brake etc. When driving a heavy load vehicle, it is impossible for human to generate the braking force. So an another power system is used to generate braking force which force the braking pads and generate a friction force between brakes and tires which tends to stop the vehicle. Air brake system uses air to generate this force. 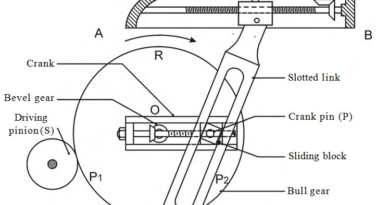 This type of braking is similar to the hydraulic brakes expect these brakes uses compressed air to apply brakes instead of hydraulic pressure.This is basic concept of any power brake system. Now we discussed how this system uses air to generate braking force. 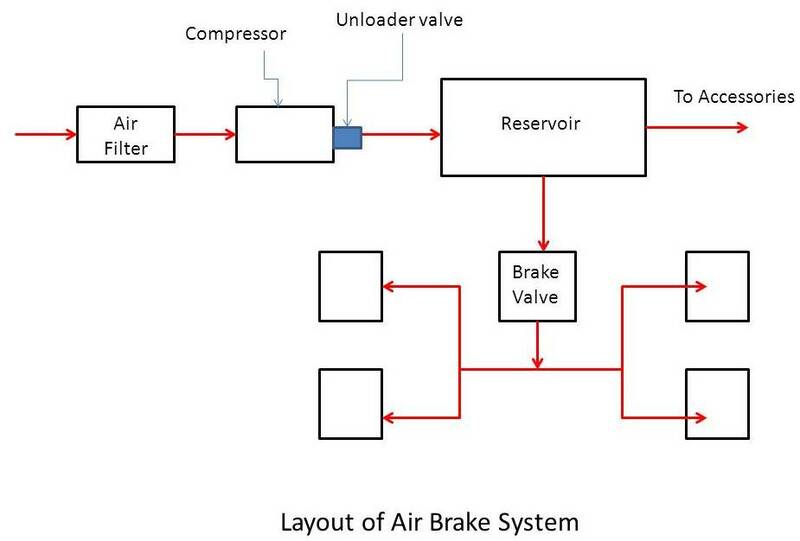 Air brake can better understand by the layout diagram as shown in figure. This system mainly consist a compressor, air filter, reservoir, valves and brake pads. The compressor takes air from atmosphere through an filter and compressed it. This compressed air sent to a reservoir through the unloader valve, which gets lifted or opened at a predetermined reservoir pressure. This air supply to brake chambers which is also called the diaphragm units situated at each wheel, through the brake valve. The brake valve is controlled by the driver who can control the intensity of braking according to the requirement. When the driver pushes the brake lever, pressure in the reservoir decreases which pushes the brakes pad toward types and apply brakes. 1. 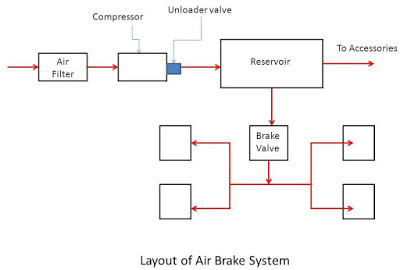 Air brake system are much more powerful than the ordinary mechanical or hydraulic brakes and that is the reason they are exclusively used in heavy vehicles. 2. They are easy to install on chassis because it is interconnected by pipes. The compressor airs can also use for tyre inflation, windscreen wipers, horns and many other accessories.Today we have discussed about air brake system. If you have any query, ask by commenting. Thanks for reading it.